I have been making Jane's Starry Button Bracelets and each one literally uses over 300 beads! Incredible but the effect is always stunning. So here are some pictures. And this is a banner that I have made for the forthcoming exhibition, hopefully it will hang outside the church to attract people to come inside and view the exhibits. The pictures you see above it are Batik from Indonesia and I cut the letters out using material from Africa and Indonesia as well as England. Actually it looks rather fun hanging in my home! I am very pleased with the way these necklaces have turned out and now would like to make some earrings to match, but not sure about using the same pattern as they would come out fairly large and not everyone prefers them like that. Using finer thread would not help because of the size of the beads, so the pattern needs a bit of adaption. 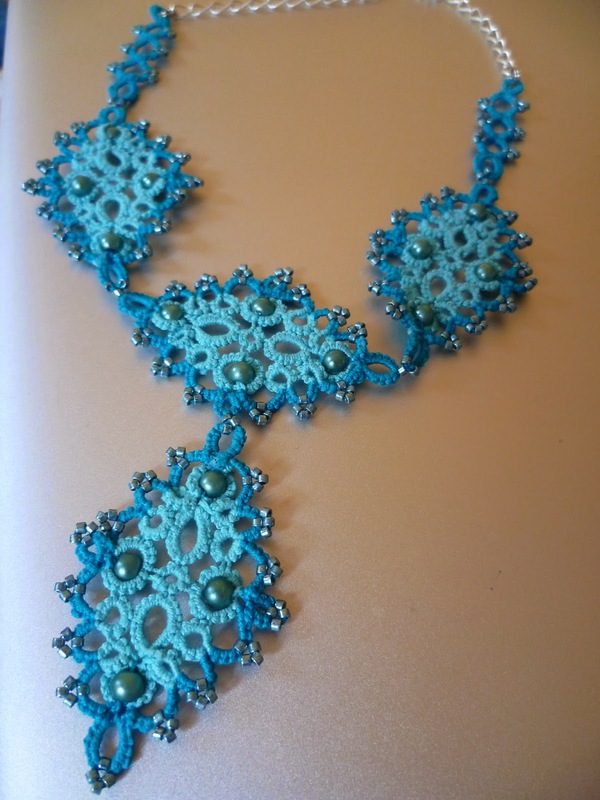 I wore a tatted necklace today, not one of these though, and the check out girl at the supermarket recognised it as tatting, sort of amazed because not many people can identify the craft. 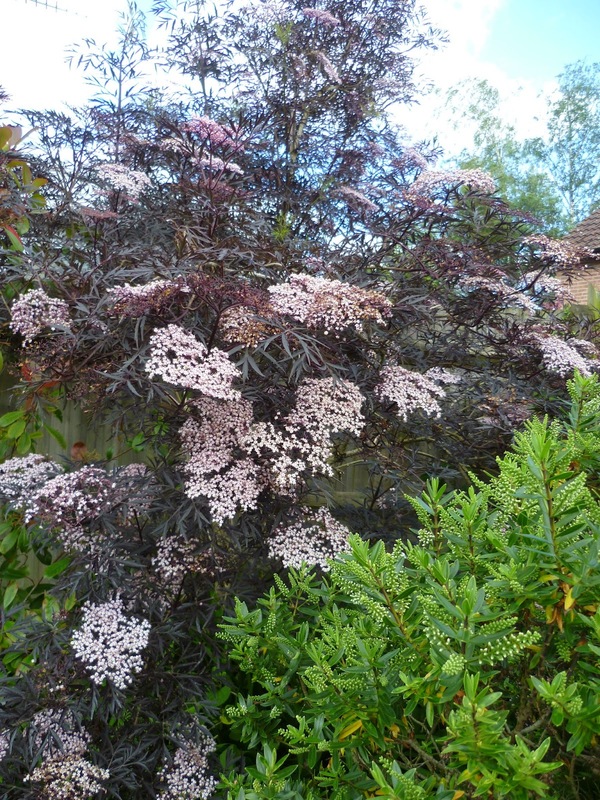 This is the plant that the blossom is from in the previous post it is a Sambucus nigra - Black Lace. This is what it says about the plant "With exotic dark foliage, reminiscent of a Japanese Acer and gorgeous pink flower clusters, this is a truly outstanding elderflower and, with the added bonus of autumn berries, is suitable for wine-making." Obviously I did not read about the 'wine-making bit at the time of planting but have subsequently found out that you can make a cordial with the flowers, it is too late for this year, but will have a go next time it flowers. Have also finished Renulek's Spring and Summer doilies which I will photograph and let you see soon. 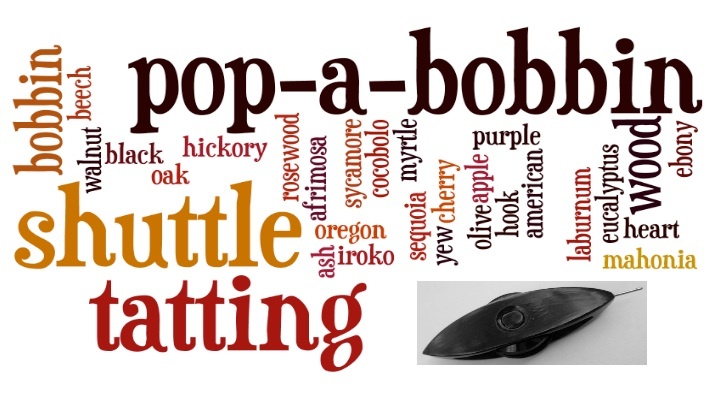 Which should instantly remind you of the James Bond Film! But these diamonds are a little different, obviously not the real thing, just the diamond shape. They are from Jane's pattern which you can find here but as you can see I have added a few beads. I have also used two different shades of thread, but the distinction between the colours does not show. The pearl beads were made in Korea and a year ago this week I purchased them from China Town in Singapore - in fact from The People's Park shopping centre which is where Wendy likes to shop and those who are looking for tatting supplies. The pearl beads are added to the self closing mock rings and you can find this technique here. I am still working on these diamonds and hope, unless I get distracted or just too busy, to finish the project before the week is out. We ('Im in the garage) and myself are still working on items for the Art and Craft Exhibition in the village, there is no competition involved just a place for people to exhibit what they have made and also sell them if they want to. It takes place next month but so far we have very little entries on paper, although quite a few people have promised items. Another exhibit which 'Im in the garage has made is this dog a 'kumiki' or a Japanese interlocking wood puzzle. I have yet to learn how it fits together, too frightened to take it apart to show you at the moment! This dog has ebony wood as its eyes and is made in mahogany and beech, he now has a mate as we plan to let people play with one whilst the other dog remains intact. 70 years ago there was great preparation in the part of England in which I live for the D Day Landings - the allied invasion of Normandy, France during World War II (6th June). Military vehicles and service personnel were parked up in the villages ready for the invasion. 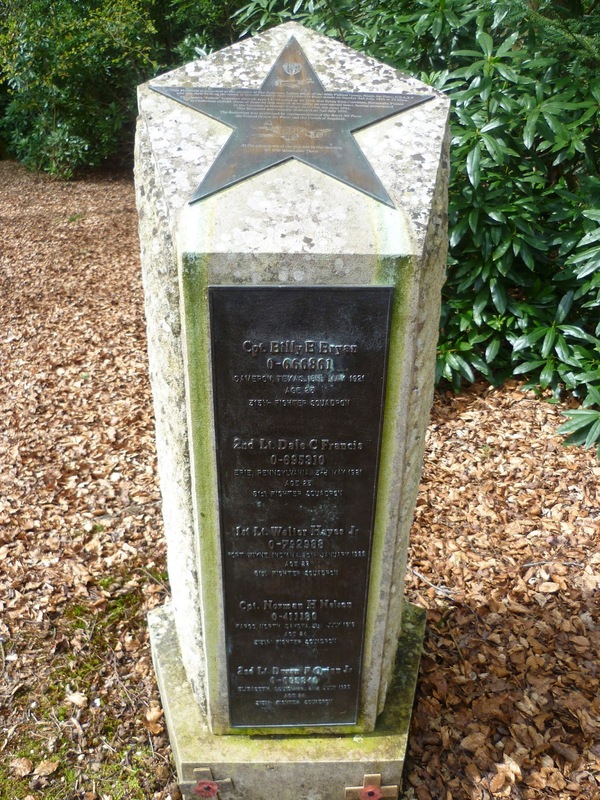 70 years ago on the 2nd July an American aircraft flying back from Normandy to England came down in woodland near St. Marks Church in Ampfield, it was not on a combat mission but transporting personnel between bases. Sadly the aircraft developed engine failure and five American air force men from the 50th fighter group lost their lives . Whilst I was working in the wood with a group that meets once a month to keep it in good order I noticed that the 70th anniversary of this fatal crash was approaching so asked if there could be some sort of act of remembrance around the memorial to the airmen. In a months time there will be a service and I hope to tell you the remarkable story behind this memorial which was erected in 1998. Someone who attends this particular church asked me if I could make her some earrings and a pendant to match as she had noticed that I was wearing some earrings made with heart shape beads. She attended a wedding this weekend in France and wore the set.